So some bad news for realtors… especially those who advertise on Facebook or are looking into doing it. For a long time, Facebook Ads have been a great place for Real Estate Agents to find quality leads and sell their listings. But Facebook has recently removed some of the features that made advertising so great. The fact of the matter is, this is actually good. It forces advertisers to be more creative and to use more advanced advertising methods. In an article written by Sheryl Sandberg, the COO of Facebook, and published on March 19th, she goes into detail about the ‘epidemic’. 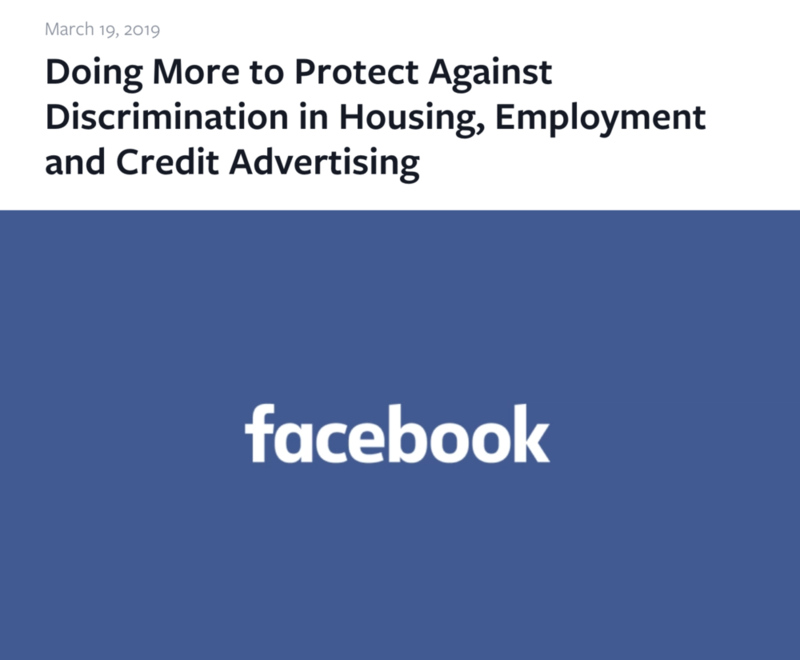 I’ve included the link here, so you can check it out, but it basically says Facebook found that some of the targeting advertisers were using for housing, employment and credit ads were discriminatory against certain peoples, so they changed the way advertisers can target users in those three categories. What targeting did they remove? Oof. That’s a big blow to realtors. You can no longer target users through age, gender, or zip code. They even add salt to the wound by saying that you’ll have a much smaller set of targeting categories to use in your campaigns. It does make sense, and anyone whos been paying attention to Facebook recently would know that this was bound to happen. Before you start freaking out, you need to understand that this is more of a blessing than it is a curse. Now that I have your attention again, let’s see why that could be the case. First, detailed targeting like they’re mentioning here is not the best way to reach users who want to buy from you. Most casual Facebook Advertisers don’t know this, but the pros all use something call Lookalike Audiences. A lookalike audience is where you upload a customer file, of more than one hundred users (so Facebook has enough data) and analyze each and every person in that file. They then take that data and find other users on Facebook that have similar behaviors and demographics to your existing list. It’s a fantastic resource that will allow you to enjoy overall cheaper Cost Per Clicks and Cost Per Leads. Your ROAS (return on ad spend) will be significantly higher as well. That’s why this is a blessing. It’s forcing all the users not taking advantage of this already to switch or quit. If you stick with it, you’ll have less competition AND higher returns! There are two answers to this, and both involve using ads to build a list. The first is to start with very broad targeting and build a list over time with people who are interested in your offer. This can be a general awareness campaign that just gets users familiar with your brand and gives them an offer that’s related to housing, such as a “free guide” to real estate. The second option is still to use detailed targeting, which won’t be as effective but can be just as useful. You can target users based on interests, with no demographics. To do this, you need to start with a customer avatar sheet. This is where you brainstorm all the things your idea customer might be interested in, tv shows or networks they watch, podcasts they listen to, books they read, and so on. This is a powerful tool you should be using already, as with the Lookalikes. It helps you truly understand who you’re trying to advertise to and lets you approach many different angles. For example, when I do advertising for housing, I target things like home improvement and HGTV, because I know middle-aged users would be interested in both of those, especially the ones that might be interested in moving. So that’s the solution to advertising real estate in 2019! I hope this was helpful, and maybe your ads will improve because of this. If you’re a realtor and you’d like some help with creating a Lookalike Audience or help with Facebook Advertising in general, feel free to contact me at nicholas@focuspointvisuals.com!